I’ve written before about how my Muse plays games with songs and music videos that tie into what I’m writing. Here’s one example from Dolphin Girl, and I’ve still never told the story about the theme song for the Angel in Training series. After I started writing the Denim Days series I would listen to the radio and jot down songs that seemed to capture Mel’s feelings and Duncan’s feelings. Chasing Cars by Snow Patrol is one example. Big Girls Don’t Cry by Fergie is another. These are great songs and I listened to them again and again while writing the books, but none captured my imagination like Realize by Colbie Caillet. I still remember exactly when my Muse smacked me in the face with this song. One day I was on the way to the grocery store and Realize came on the radio. I was about half way through the first book, which was set at a lakehouse in Minnesota. Such a strange choice for me. I never lived in Minnesota. And, while I spent time at a lake during my childhood, and felt very nostalgic about that time, I never had any romantic experiences there. This song seemed to be the perfect choice and even though I’d parked and needed to finish my errands I stayed to listen to the end of the song and to make a note of the title and artist. When I returned home, and after the groceries were stored away, I pulled out the note and pulled up Realize on YouTube. My Muse was messing with me yet again. Every time this happens it’s always been the same. The song, lyrics, and feeling match what I’m writing and then I watch the video and the images match, too. Coincidence? I don’t know. All I do know is that it spooks me and thrills me, strangely, at the same time. The ending of this video is not how the series ends, so if you haven’t finished the series you don’t have to worry about spoilers. Sometimes I look for a theme song before the book is written or I trip over one in the middle of writing it. In this case, I’d already written, titled and published the book when I went looking for a song that could fit The Summer We Stumbled, the second book in the Denim Days series. The second book is for sale on Amazon as an ebook, or can be borrowed through the Kindle Unlimited program. It’s available here. If you missed the first book, you’ll probably want to start here. I love a bunch of Dashboard Confessional songs (“Hands Down”, “Ghost of A Good Thing”, “Vindicated”) but the one that ran through my head as I wrote The Summer We Believed was “Carry This Picture”. The Summer We Believed is the first book first book in the Denim Days series, which tells the story of Melody and Duncan over the course of three summers at their lake houses in the North woods of Minnesota. In the first book, the two main characters have been friends since the womb and the summer before they enter college they feel the tug of stronger feelings. I really wanted to tell the story of the three summers without all the events that happened in between. Some of the events get included as backstory or even as a part of the main story, but it’s definitely not the traditional structure of one novel, so the series is being released as three shorter books. Eventually, I’ll put out a compiled version, but wanted readers to experience the summers the way Melody and Duncan would have experienced them—with a break in between. This song feels like it was written from Duncan’s point of view. There’s a key scene in the story when they take a picture together. It’s an important scene in the first book, and in some ways the picture is even more important for the second book in the series. Unfortunately, there’s no official video for this song—I think it would have made a great one!—so, I’ve included a fan video from a concert. And, if you’re interested in reading about Melody and Duncan’s first summer it’s available as an ebook here. Or it could be that it’s home—the place we all come from. Regardless, I’m fortunate to live close enough to get there any day. I don’t get there often enough, mind you, but I can. Today, June 8th, World Oceans Day, “is an annual observation to honour the world’s oceans, celebrate the products the ocean provides such as seafood as well as marine life itself for aquariums, pets, and also a time to appreciate its own intrinsic value.” With nearly three-quarters of our big, blue planet made up of seas, one day of attention doesn’t seem to be too much to ask. In fact, I’ve often thought, that the ocean might hold the answer to some mankind most gnarly problems if only we’d think about it in some new ways. If you’re not sure how you could contribute, here are some ideas for last minute celebrations. For my part, I’m doing two things. The first–Wear Blue, Tell Two, is an initiative for increasing awareness. Actually, I’ll tell more than two, but that’s the catchy name for it. 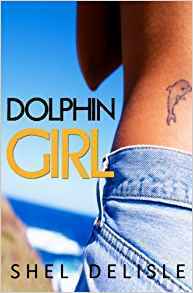 And, second, I’m contributing 100% of the proceeds from today’s sales of Dolphin Girl to The Ocean Foundation, the fiscal sponsor of World Ocean’s Day. Jane, the main character of the novel, is spiritually drawn to the ocean and its friendliest citizens as she seeks to break away from her oh-so-ordinary life. It’s specially priced at 99 cents for a limited time at Amazon. I hope you’ll leave a comment and let me know how you’re celebrating the day. And I hope you enjoy this song by Bob Schneider, along with some beautiful images of marine life. MY WISHFUL THINKING has had an on-going identity crisis. Sales have been very meh compared to my other books, which is strange because it’s in the same vein. My biggest frustration had been that it has been difficult to find a cover that matched my vision of the novel. Sometimes knowing too much makes it harder to figure out the what can capture what’s inside. The novel has a couple storylines–one about best friends, one about wishing, one about family/divorce, and, finally, a romance with a nerdy-hot genie. I’d hoped the floaty balloons would capture the feeling of wishing. But then, I decided the couple was too small, especially as a thumbnail. So, I made a change. Okay. Now the couple was larger, but they looked so young. Younger than the characters the story was about … and, apparently, younger than most people want to read about. It needed a big time change. The same way Lo, the main character, needed to change. I felt like Sheryl Crow in this video, throwing everything out the window as I went through stock art. Then, I found something that could work. My cover artist worked his magic better than any genie, and made it better than I’d imagined. So *drum roll* here’s the third (and, hopefully final) cover. I’m happy with this one. It kinda-sorta captures a pivotal moment in the story. The couple looks like an more mature version of the characters on the older covers. Everything about it feels more 2015. Why did I wait so long? Probably because change is hard, even when it will do you good. Maybe… especially then. Same story new cover available to buy or read on KU at Amazon. I know the change has done me good, and hope it’s a change that helps the book find a broader readership. What you got cookin’? Now, that’s a question, isn’t it? It started with one just for friends and family. Every year at Christmas I bake cookies almost non-stop, and so I compiled a book of all the goodies I’ve made at that time of year with some tips and a little history about why I cook these things. It was supposed to be a gift or a replacement for greeting cards, but I got involved with marketing a boxed set last year at the holidays and that took precedence because it affected seven other authors. The book didn’t get finished in time. I completed it in January, because that’s how I am. Once something is on the to-do list I have to get it off. So, I figured I’d hold off and use it this year, but then I decided what the heck I’d publish it and just wait until the end of the year to promote it. A couple months later it hit me that I do a Cinco de Mayo party every year. So, I pulled together my favorite recipes and added a few things I’d like to try in future years and published it. Then we were heading down to the Florida Keys for a mini vacation. I wanted to play bartender and make some new tropical drinks. that’s when I pulled together a bunch of recipes into a book of beach drinks. I never really intended to sell a lot of these, but it was something to work on everyday. It kept me in front of the computer and I actually got more fiction writing done because this non-fiction was straightforward. It worked like a palette cleanser. In July, I decided to make the Mexican Cookbook free for a few days. I didn’t promote it. In fact, I really couldn’t promote it–there was only one review. For some reason that book took off, snagged by Amazon’s algorithms. It was a great reminder of the power of Amazon and the power of free. My post-free bounce took the book to number one in the Mexican Cooking category, where it hung out for a while. It’s still ranked much higher and is selling much better than in did in the pre-free period. Which brings us to today. Beach Bar is free. You can find it here. Jimmy Buffett is the perfect person to sing about Margaritaville or Pina Coladaville or Tequila Sunriseville or my eCookbooks. Also, until I watched this video, I never realized how much he Larry David look alike. I’ve never seen them together, so do you suppose…nah, it couldn’t be. Anyway, hope you enjoy the song and grab a free book. Til next time…how’s about cooking something up with me. The first time I heard this song by Fort Minor was when my oldest son showed me a video of people doing all these crazy athletic feats. Not the kinds of things that people can make a living with, but rather things that they did for love. Skateboarding tricks. Freestyle. The most unlikely basketball shots ever. The afternoon that he stumbled upon it, we watched that video over and over and over, because it was mind blowing. Then we showed it to my other two sons. And my hubby. And anyone else we could rope into watching it. I loved the lyrics that weighed out skill, luck, pain, pleasure, and will power. Aren’t those the ingredients in any success, even if the percentages are slightly different for everyone? Today, I’ve picked it for the Music Monday post, because I’d like you to remember the name M.E. Wynne. Exactly. No one knows who that is, but it’s the pen name I used on my new novel GLORY. I decided to go with a pen name, because I was worried that my regular readers might not like the story. It’s not as sweet or funny or light hearted as other things I’ve written, but it’s still me at it’s core. It’s getting off to a much slower start than my other books, and who knows, in a month I may change the name again. Or, maybe I just need to be patient enough to wait for some percentage of luck to show up. At least one reader on goodreads liked it enough to bring it into her classroom shelf. That review made my day. I spent some time debating what song to play for a Music Monday post on St. Paddy’s Day. I’d already talked about the Dropkick Murphy’s I’m Shipping Up To Boston a couple years ago on Facebook, and U2 is one of my favorite bands, but one of their songs could work any time during the year on almost any subject. I listened to The Cranberries and couldn’t decide between Linger or Dreams or Zombie. I love all of those songs, but none of them suited my mood today. The only one that felt right was Toss the Feathers by The Corrs. It’s Irish through and through. For Valentine’s Day the eBook Bundle TEXT ME: 8 Novels of First Love has been discounted to 99 cents. I’m one of the authors in the bundle, along with Shana Norris, Amanda Brice, Juli Alexander, Elle Strauss, Cindy M. Hogan, Kate Avery Ellison, and Kat Brookes. We’ve been featured in FKBT, over at the new web-site for Ultimate YA and in posts at Cindy M. Hogan’s blog and Kai Strand’s blog. Be a sweet Cupid and stop by everywhere and follow these folks or sign up for newsletters or say hello. <3. And if you haven’t read the bundle yet, it’s light-hearted younger YA. Also, starting tomorrow, February 11th, MY WISHFUL THINKING will be one of the Kindle Countdown Deals and it’ll be featured by BookBub on the 12th, discounted to 99 cents. Finally, one more offer. STORYTIME, a book of five read-aloud short stories is now available at Amazon for 99 cents. And, because it’s Music Monday, a song. This song is an oldie (1997), but a goody. My youngest, who wasn’t even born yet when Semi-Charmed Life hit the airwaves, likes to listen to it on the way to soccer practice. I think it’s probably the catchy doo, doo, doo that hooked him. It’s another perfect example of how when music went digital songs got a new life. Or an extended life. It’s happening to books, too. An author friend of mine who has been around publishing for a while told me that she had some “zombie” books. I wasn’t familiar with the term and asked what she meant, because these books aren’t stories about brain-eating monsters. No, no, they’re not. Basically, these are books that died years ago, and then recently got up and started walking around again. The term made me laugh, but I’m happy for her and for the readers who are finding old stories that are new to them. And, while all of the above is a great reason for featuring Semi-Charmed Life on this Monday, that’s not why I picked it. No, no it’s not. There’s a line in the chorus: I want something else to get me through this life. Something Else Publishing is the name I’ve been using as my imprint, and I’m now offering whatever expertise I’ve gained in the last two-plus years to people who want to try something else when it comes to publishing. In a nut shell (or in this case a seashell), I thought about what I would’ve wanted as an author in a publishing partner, and that’s the concept behind what I’m calling partnership publishing. To be honest, I don’t know if I’ve coined the term, or if someone else has been using this, but to me it means sharing everything: work load, risks, and rewards. If you’re an author who “just wants to write”, well, good luck, and keep pursuing a trade pub deal. If you want to control every aspect behind the creation of your book, you should go indie. Like now. Just do it and you’ll learn as you go.